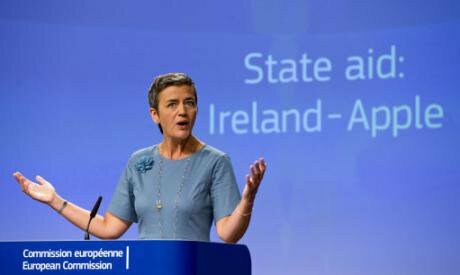 EU Competition Commissioner Margrethe Vestager at EU HQ in August, 2016 says that Ireland must now recover the unpaid back taxes from Apple, plus interest. Associated Press/Virginia Mayo. All rights reserved. Rosemary Bechler (RB): Joseph Stiglitz speaking on the BBC Today programme after yourself, said that the European Commissioner’s three years of research into Apple’s dealings in Ireland had shone a light on the dark side of globalisation, and that the deal exemplified a kind of ‘moral depravity’ – would you go that far? Molly Scott Cato MEP (MSC): I’m not too interested in the morality: that’s a different perspective on things. I certainly agree that this is effectively what happens when transnational corporations operate beyond local control, and that that is the result of globalisation. RB: Margrethe Vestager, the EU commissioner is being criticised on various grounds – creating uncertainty for multinationals, retrospective punishment, or interfering with national taxation systems – but you think she’s doing a pretty good job on behalf of Europeans ? MSC: Her job is to make sure that member states of the EU keep to EU law, and what she is doing is enforcing that law. She has found that the deal that Ireland offered to Apple was basically not fair competition. It is a single market, so people have to compete fairly. Governments can’t favour certain corporate or economic players over others. She found that by offering them this special tax deal Ireland had done that. So really all she is doing is requiring governments to keep to Treaty law, and behind that she is making sure that they don’t bend over backwards to help corporations out rather than working for citizens. If some countries work to help corporations, it undermines the ability of citizens generally to benefit. The tax that she says is owed to Ireland actually is the result of earnings made by Apple right across the European Union and so we have all been deprived of tax revenue needed for investment in our public services. RB: How long do you think this kind of ‘race to the bottom’ has been under way? MSC: It has gathered speed since globalisation took off and since companies have been able to move and transfer their profits with the speed and ease that they are now able to do. Companies selling digital products are able to do this much more easily than companies with physical products, so that is part of the change as well. Also, it has just taken people a while to wise up to what the corporations are doing. And ever since the financial crisis when economic conditions got much more harsh, people are just not prepared to put up with that any more. RB: We are told that the 13 billion euros owed to Ireland equals the annual budget for their health service – what response do you think a national government should make under these circumstances? MSC: I don’t think Ireland should get that money, because Apple are only choosing to be in Ireland because of the favourable tax regime. Lots of companies, many US corporations, book their profits in Luxembourg. But the tax due shouldn’t just go to Luxembourg, because that money was made right across the European Union and so belongs to all EU nations. One of the things we are working on is starting a public consultation about what should really happen to that money. Although it is a huge amount of money, this is only one corporation. There are lots of others, avoiding paying taxes and based in Ireland for that reason. And there are many more probably based in Luxembourg. The City of London is also running tax havens and the Netherlands is running tax avoidance schemes – so there is a huge amount of unpaid tax. MSC: I’m not sure about sovereignty. But what I do think is that it is an important indication that somebody – namely Vestager – has the courage to stand up to corporate power and to require corporations to operate for the public and for the social good, which they have not been required to do till now. Generations of politicians have bent over backwards to do anything to attract corporations to base themselves in their country, and haven’t required them to reach good social standards. The corporations have been in the driving seat. Vestager is sending a very clear signal now that if you want to operate in the European single market – 500 million of the world’s richest consumers – then you have to reach certain standards, on tax, but also on environmental standards, on employment standards and so on. RB: Apple spokespeople raise the prospect of some kind of ‘economic war’ between the US and the EU. Is that likely? MSC: What is this ‘war’ going to consist of – them refusing to sell us their products? So far the US has done things to suit itself, constantly working for their benefit. They have a law that says any tax earned anywhere in the world is basically tax earned at home if it is a US company! So part of the reason why this money is sloshing around offshore is because US corporate tax is 35% – one of the highest tax rates in the world. They are benefiting from high corporate tax rates, protecting their corporations. Moreover, they are not actually signing up for full transparency. The US has not signed up to the common reporting standard to which we are all now giving more information on tax earnings. So they have been in a uniquely powerful position and therefore they have protected their corporations. And we are saying we have had enough of that. Is that a war? I think we just want the same rules for everybody! The way the global economy has worked has been very much in favour of the US: it is not a level playing field. Take TTIP. This has failed because the US basically tried to bully EU negotiators. And their corporations have operated in a similarly high-handed way. RB: Is it a coincidence that the EU is pulling back on the TTIP negotiations at the same time as Vestager launches her challenge? MSC: I think, to be honest, that it is a coincidence. It is more to do with the fact that we are getting to the end of the Obama administration, so it is clear that that trade deal won’t go through during his presidency. And the discussion in the US is much less pro-free trade than it was. There is also likely to be a different atmosphere under the next US president, whoever wins. RB: Investors have declared a war of their own in a way, haven’t they, by sueing governments over tax-related disputes, some of them successfully lowering their tax bills in the process? MSC: I think the whole vocabulary around ‘investment’ has become a bit debased really. As I’ve said several times, in the EU as a whole, people want to trade with us because we have a lot of money to spend… so we should be much more forceful and courageous in making them meet our standards. That is why I applaud Vestager. She is standing up for Europe and saying, we have a right to demand these standards and we are going to do that! I’m afraid too many of her predecessors haven’t done that and have caved in under pressure really. RB: The City of London, as you’ve mentioned, is a big player in the internal tax haven landscape. How important is it that people begin to realise the extent of this ? MSC: It’s very important. I think people are learning fast about what is going on. The Panama Papers was obviously quite a watershed in illustrating the extent of tax avoidance, even though that was wealthy people rather than corporations. But more than half the ‘shell companies’ that were revealed in that disclosure were registered in the British Virgin Islands, so the networks that link British overseas territories back to the City of London are a key part of the global tax avoidance industry. The Netherlands have similar offshore territories, and we began with Ireland and Luxembourg who operate tax havens inside the European Union. We have a European parliamentary committee that has been set up as a result of the Panama Papers information that has some quite significant powers, and we are going to be investigating further exactly how these networks of tax avoidance work. We will be working with the EU Commission, with Vestager but also with Moscivizi who is the Commissioner responsible for tax, and our investigations together with their proposals mean that we are making some decent headway. We have to make sure that a decent amount of tax is paid because actually the corporations themselves need that. Tax pays for decent broadband networks and phones and educated potential employees – they can’t function without these things! RB: If this goes to appeal it will be alongside Starbucks and FIAT cases: could this be a turning point for this area of legislation? MSC: It’s an ongoing process. I think we are seeing the beginning of a process in which figures in the Commission but also elected politicians really begin to take this seriously. Politicians are going to have to act in the interests of the people who elect them and stand up to corporations. This is one good example of that happening. There are plenty of other spheres in which it needs to happen. And my hope is that rather than just voting in demagogues, people will start voting for politicians who will take on corporations. And instead of just moaning about their politicians, who I admit in many cases have been pretty disappointing, I hope people will demand that they act more forcefully in their interests and battle the corporations on their behalf. RB: Talking about the impact of BREXIT on this issue, you hoped that the UK would not be allowed to escape its obligations in this area – is that right? MSC: Well I see that already Conservative Home, which is one of the internal think tanks of the Conservative Party, is effectively saying – “This is a great opportunity, because we are leaving the EU and so will be able to be a tax haven now”. But it rather depends what kind of BREXIT we get. If we stay as part of the single market then obviously we will still be bound by a lot of these rules. But some of the more right wing Conservatives are now saying that we should come out of the single market altogether, which would obviously be disastrous in terms of jobs. So that’s what the battle is about now. Obviously BREXIT effects many aspects of our economic life, but tax is just one of those. RB: Both presidential candidates in the US elections are thinking of lowering corporate taxes. In terms of your hope that electorates will hold their politicians much more to account, can anything good come out of the US elections? MSC: We saw from Bernie Sanders that there is a very significant group of the US electorate that are exactly on the same track that I have been arguing, and that Commissioner Vestage is arguing. Alright, thy didn’t manage to get the democratic candidate, but Hillary Clinton would be foolish to ignore that. She would be foolish to go all out to appeal to the corporations when that is just a tiny proportion of the people in the US. Who knows where Trump is coming from? I really find it impossible to make a serious comment about his policy because it is rhetoric. But for Hillary Clinton, this is one of the things she is going to have to weigh up. She knows that she is not popular and that she had much stronger competition from Sanders than she would have expected. She should, if she is a good politician, move some way towards some of their concerns, and taking a serious approach to tax avoidance would go a long way towards doing that. RB: So, to conclude, where will this play out most importantly in terms of public opinion? How important are trade unions for example? What are your hopes? MSC: You can see how important popular support is, because as Greens, we started this battle in the European Union, and now Labour and the Socialist Group more generally are endlessly competing with us over being seen as the leaders on these issues. So that tells you that there are votes in it. RB: As an MEP looking across the European Union, do you think this type of politics could be the basis for a progressive coalition between social democrats, greens, feminists, and others? MSC: Part of the reason why people are losing faith in the European Union and in politics more generally is because they are asking, “Well what are you doing for me?” They don’t see politicians serving their interests very well. I think that sort of centrist politics that said, “Well. We will just trust the corporations to run our economic life, and we will have minimum government involvement in the economy” – hasn’t worked. People are now demanding from their politicians that they do offer more in terms of engagement with economic life, whether that is through better public services, or making sure that corporations pay their taxes to fund those services. We are moving in that direction now and I think that is entirely right. Some of what I have written about the Apple issue is couched precisely in those terms, saying, “This is the European Union acting for citizens, and this is what we have lost as a result of voting to leave…”. I’m chuffed, because I am an admirer of Margrethe Vestager, and I think she is a tough cookie and a clever woman. She has got the bit between her teeth and she won’t be stopping. This is the beginning of what she plans to do – and good luck to her!